These five-puzzle sets are inspired by the characters and complications of beloved books. From the caterpillar's perplexing questions in Wonderland to the secret of the Tin Man's compassion in Oz, classic children's literature is full of puzzles. 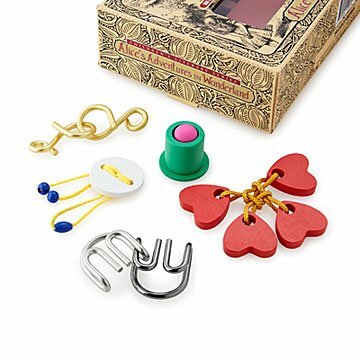 These sets of five brainteasers are inspired by the characters and playful predicaments in beloved books: Alice's Adventures in Wonderland, Peter Pan and Wendy, Treasure Island, and The Wonderful Wizard of Oz. Challenge your spatial skills with the interlocking wood of Treasure Island's stockade, or tackle the tantalizing metal links of Alice's Cheshire Cat's grin. Made in China. I really wanted to love this gift I got my nephew for Christmas. However it didn't give instructions or a diagram for taking them apart or putting them together. Was a little frustrated with that.